Want to know some amazing DIY fairy garden ideas? Yes, then you are landed in the right place to get all the insights of creating an awesome fairy garden. Ready? Let’s dive in! Well, before that have you ever wondered why our kids need a fairy garden? We all want our kids to be imaginative and creative. 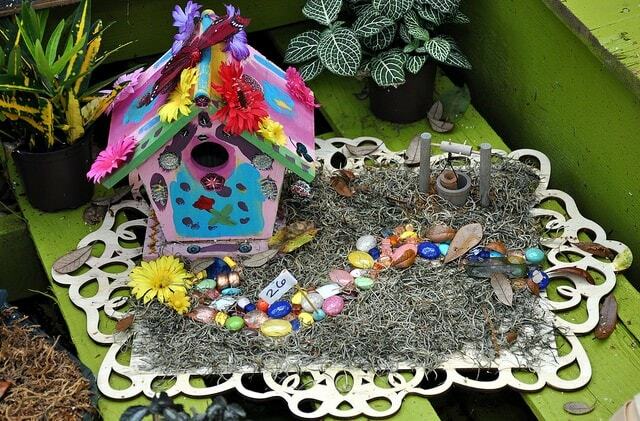 Creating a fairy garden develops creative skills in our kids, it gives wings to their imagination. 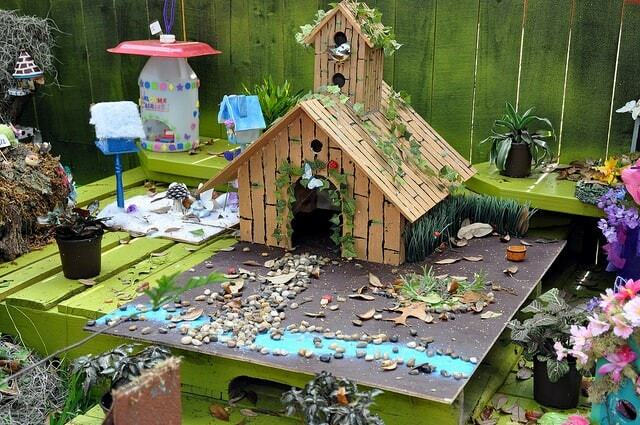 The fantasy of fairy garden inspires them to think out of the box and helps to develop their problem-solving skills. These creative challenges help our kids in their real-life situations to take a creative approach towards their tasks and it guides them in solving small problems of life and to take advantage of challenges to improve themselves. Let’s take a closer look, what is fairy garden? 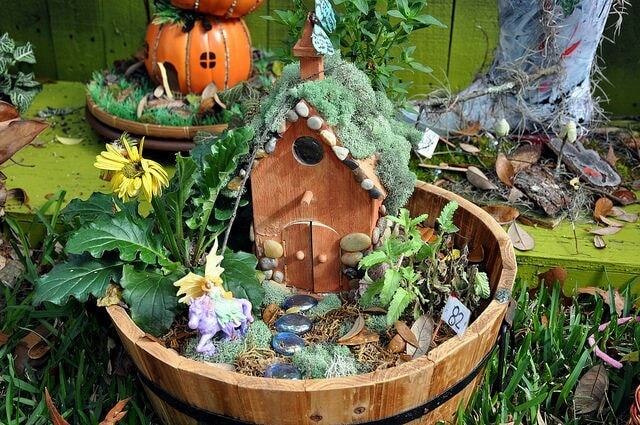 A fairy garden is the miniature form of a garden which includes tiny houses, idols of fairy, animals, plants, and ponds. It’s all about detailing of all these kinds of stuff. The main idea behind the concept of fairy garden is to create a whole world of imagination, so that not only kids but the elder once also fall in love with this tiny garden. First up, you have to decide on the scale of your fairy garden. Initially, start with a small area and then scale up to a large area depending upon the actual area or free space of your house and surroundings. 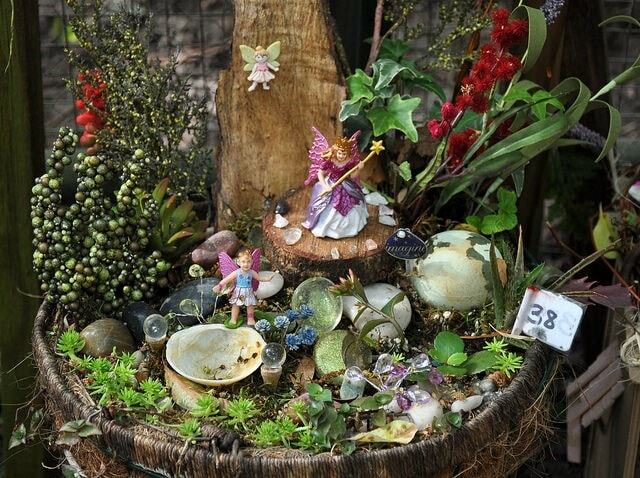 Additionally, you also need to find a suitable theme for your fairy garden based on your personal preference. There’s a lot to cover, so let’s dive in! No matter where you decide to make your fairy garden, indoor or outdoor you need to select a suitable space to create the entire structure. If you want to scale up the garden at some later stage, then leave some extra space for expansion. Select a container of 10 – 12 inches or small pots of 4 – 5 inches. 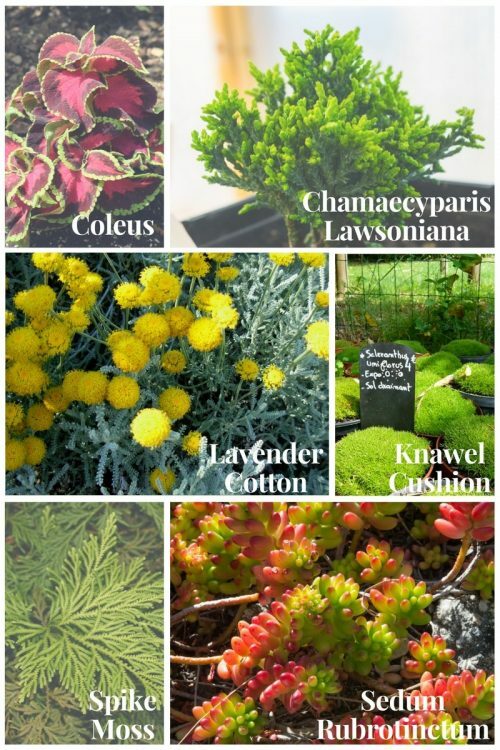 Select plants based on the indoor or outdoor location of your garden, to get proper sunshine, shade, and water for plants. Fairy garden accessories cover most of the small parts, like cottage/ house, table, chair, ladder, basket, mailbox, small fairies, pots, and butterflies. Additionally, all other decorative items used in the fairy house. 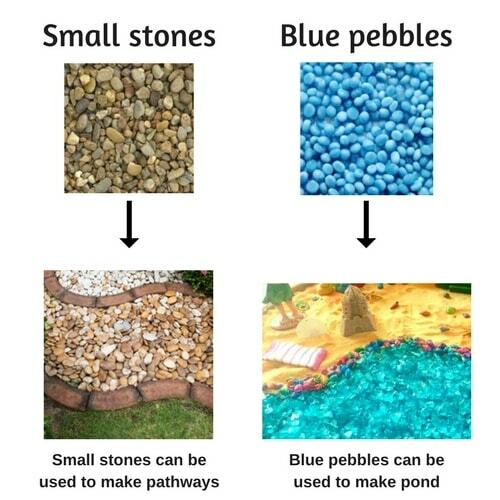 The third step is to make landscape and pathways using pebbles and small stones of the fairy garden. Next is to create water bodies like ponds, waterfalls, and beaches which fits according to your theme. Also, need to create idols of animals like hens chicks and lamb. Plants are another important components of fairy house which we address in this step. 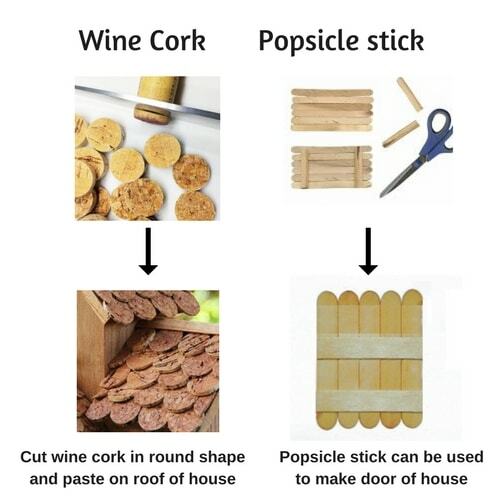 There are many easily available household articles, which can be used to make different components of a fairy house. It’s fun let’s begin! 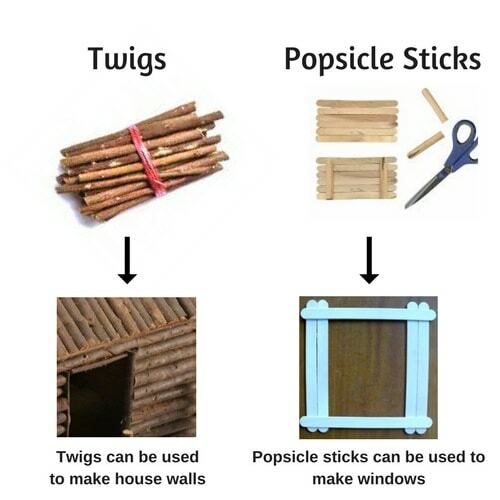 For making the house structure we can use twigs and wood pieces or cardboard, cut them in right size based on your structure, bind them together using glue. Oven bake clay can also be used to finish up the house structure. House roof can be made using a piece of cardboard and twigs, paint some patterns over that to look like a roof. For the chimney, we can use toothpaste box and cut them to form a chimney shape or a tower of the house. House windows can be made by using popsicle sticks or wood dowels, forming a window shape by applying some glue at the ends. For making fairy door use wooden chipboard, which is easily available in a craft shop, cut in proper shape and paint it. Doorknobs and handle can be made using beads and buttons. First up, you need a base for the pond, make a shallow wide hole on the ground, put some blue sand or blue marble to look like water and use small stones or rocks to outline of the pond and its ready now. One can also use a wide saucer or bowl to make the pond for a different look. The trick here is to look at your surrounding and collect easily available things like shells of pistachio and walnut, empty nail paint bottles or even bottle caps. 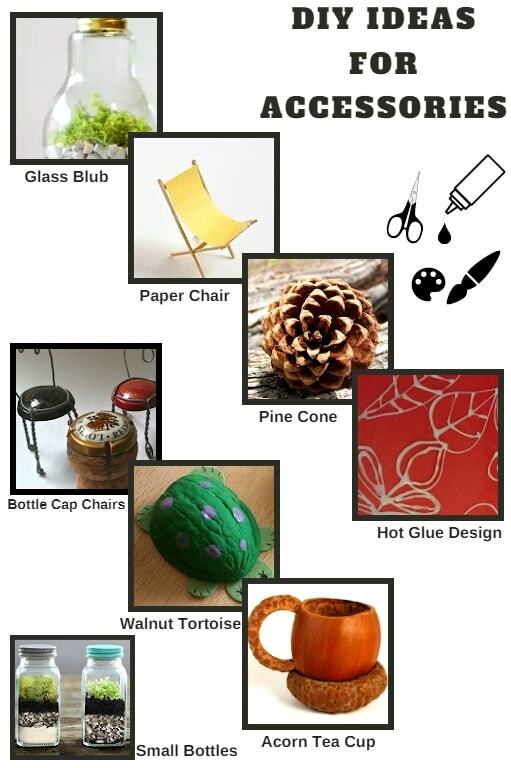 All these things can be utilized to make some awesome crafts for fairy garden accessories. Using popsicle sticks to make benches and windows. 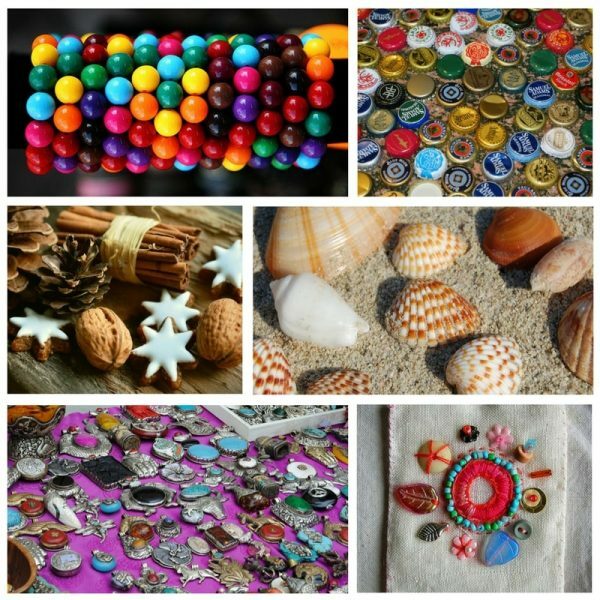 Using Marble, pebbles, stones, sand, seashells and old buttons to make decorative. Using twigs and string to make the ladder. Using walnut and pistachio shells to make tortoise. Using acorns and its caps to make accessories. Using old teapots, cups, and spoons. Using pine cones to make Christmas tree by coloring it add some glow. Using hot glue to make a decorative design. Using moss which looks like grass. Using the piece of colorful fabric as decorative. Using tree barks for the roof of the fairy house. Using plywood decorate with beads. Using empty nail paint bottles can be turned into a colorful craft. Plants are the vital parts of your fairy garden, Of course, they provided the green look and the colorful leaves and flowers go hand in hand with the theme of your fairy garden. One final thought…. 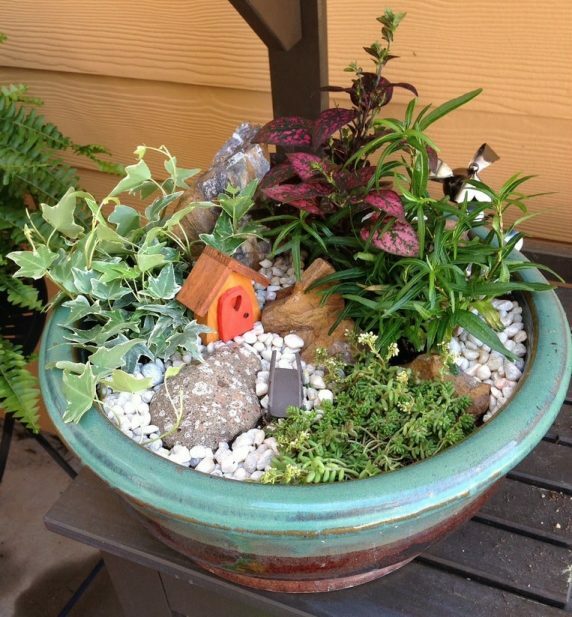 DIY fairy garden can be fun if you collect more items from your surroundings and put your creativity to work to get great results. Thanks for visiting the article. Please also visit my article on life skills for every kid. If you like it please comment and share with your friends.